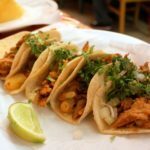 Dos Perros — A Mexican Place in the Heart of Downtown. At Dos Perros, we honor that rich culinary heritage by serving classic Mexican cuisine alongside a thoughtful beverage program in an updated but warmly styled space. This isn’t formal dining; it’s simply a step up to a place that can be event dining as much as dining before an event.